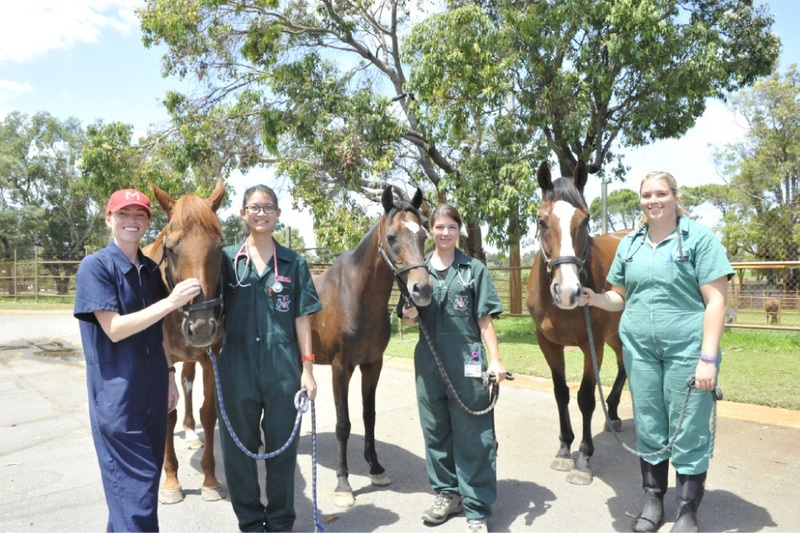 Veterinarian Annemarie Cullimore (left) with the horses and some of the veterinary students who helped treat them. Berti, Patrick, August, Snoopy and Secret were among 33 horses at the Western Edge Horseback facility near Logue Brook Dam that was badly damaged in last month’s blaze. The horses was transported to MUVH where they received six weeks of intensive treatment from a team of veterinarians headed up by equine specialist Rachael Smith. “All of the horses have done really well and we didn’t have any infections or serious problems to speak of at all,” Dr Smith said. Dr Smith said all five horses would be able to return to a normal life, although some areas of scarring would require additional sun protection in the short term. “All of the horses will definitely be rideable, but the new skin around their scars is very sensitive to the sun,” she said. Berti, who was being leased to the now-defunct trail-riding business, returned to his original owner last Tuesday, while the other four horses went back to Logue Brook Dam on Friday. While physically recovered, Dr Smith said it was difficult to say whether the horses had suffered any long-term physiological damage. “They have certainly not shown any signs of long-term effects in terms of behaviour, so the signs are good,” she said. MUVH provided all care – estimated at between $5000 and $10,000 per horse – for free.